A sitcom about the relationships among three couples from one family. They include an unmarried pair who've lived together for nine years and the woman's parents, a longtime married duo. Featuring Joanna Garcia ( from Reba) and Jennifer Finnigan (from That 70's show and as I know her, Alice, Phoebe's brothers wife on Friends!) It will fill the time slot before Modern Family, so if it's as strong a comedy as the other Wednesday night shows, ABC should have a pretty strong line-up. Synopsis: What a difference 10 years can make. In 2000, a documentary crew follows a disparate group of high schoolers from Greenbelt High School in Austin, TX as they prepare for graduation. Jump ahead to 2010 and these former classmates have returned home to rediscover that just because they’re not where they planned to be doesn’t mean they’re not right where they need to be. I'm a sucker for these reunion types of shows, so we'll see if this one can live up to all the hype. Synopsis: This legal drama from executive producer Jerry Bruckheimer follows friends and rival lawyers Kathryn Peale (Tierney) and Jimmy Brogan (Morrow) as they show each side of a case equally. It keeps the audience guessing, shifting allegiances and opinions on guilt or innocence until the final scene. Seems like an interesting concept that hopefully will be as intriguing as it sounds. Starring Michael Chiklis (The Shield) and Julie Benz (fabulous as Rita in Dexter) this show is about a family who gains superpowers after their plane crashes in the Amazon River. Think "Hero's but less complex and confusing and more family friendly. Body of Proof is a new drama about a medical examiner that also looks promising . It stars Dana Delaney, Jeri Ryan and what I believe is the guy from the Miller High Life commercials. There is no premier date for it yet. Mr. Sunshine, starring Matthew Perry and Allsion Janey, centers on a San Diego sports arena manager who goes through a mid-life crisis when he turns 40. This is expected to be a mid fall addition. Jim Belushi and Jerry O'Connell play defense attorneys in Las Vegas. If they can find the right balence of drama and comedy, this may be one of the Fall's best new shows. I'm rooting for Jerry O'Connell who has had a tough time finding a good show. Based on Justin Halpern's popular Twitter feed about the outrageous observations of his politically incorrect father, the show stars William Shatner as the grumpy dad. He invites his son (Jonathan Sadowski) to move back home after the young man loses his job as a writer for a men's magazine. With an all star cast, Tome Selleck, Bridget Moynahan,Will Estes and Donnie Wahlberg, this New York crime drama focusing on a multigenerational family of cops headed by the city's police commissioner looks compelling. But with a Friday night time slot, it may not gain the viewers it needs to be a hit. NBC showed nothing too promising to me. My husband is excited about the premier of "The Event", which looks ok, but I am reluctant to get into it. We got into "Flashforward" last year only to be disappointed and left hanging when it got canceled. "Outsourced" seems like it could be funny and a good way to round out NBC's Thursday night of Comedies, but I'm just not all that excited about it. "Love Bites" starring Becki Newton formerly of Ugly Betty and Greg Grunberg of Hero's, was originally set to premier in the fall but was pulled last minute due to some writing changes and character problems. It is tentatively set to air mid season after The Apprentice. If it can pull itself together, it promises to be a cute show. CW's "Hellcats" intrigues me as does "LoneStar" on Fox. And two new comedies on FOX, "Raising Hope" and "Running Wilde" premiere 9/21 after "Glee". I have my DVR set to record both! Check back for reviews on all the upcoming shows! Also this week: Check back Thursday and Friday for "Then Came Marriage" Part 2 of this post. 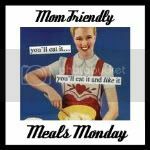 And get your best recipes ready and meet back on Monday for Mom Friendly Meals Monday. I made a button for it, so be sure and grab it! 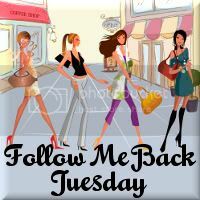 The link is above my blog roll on the upper right hand corner of my post! Today Kevin and I have off together! While he takes a nap with Jack, I'm checking out a few blog hops. Here from FMBT! I'm following you chick! Have a great week! This fall involved actually looking at Entertainment Weekly's combined schedule to resolve some DVR timeslot conflicts! I'm really excited for NBC's Monday night line-up, at least through the 8 o'clock hour...Chuck (a household fave that I HIGHLY recommend watching if you're not already) back to back with The Event!? It could be awesome-- or it could be like the first season of Heroes where the first season is amazing and then they run out of juice. What returning shows are you excited about? Sarah- As for returning shows, I was excited for Gossip Girl last night because apparently there is still a 17 year old girl trapped somewhere inside me. Tonight I am excited for Parenthood. As for the rest: I'm really looking forward to Modern Family's return next week as well as Glee, Grey's, and Dexter especially. And I am super excited for the Premier of Boardwalk Empire! I'm obsessed with the 20's and the mob, so I already love this show!!! I totally was jazzed for GG! It looks like it'll be a pretty good season, if for nothing else than the costuming! Parenthood's premiere this week was also strong- that show pretty much makes me laugh and cry every single episode.